A great combo of sustainable lovelies for the bathroom. 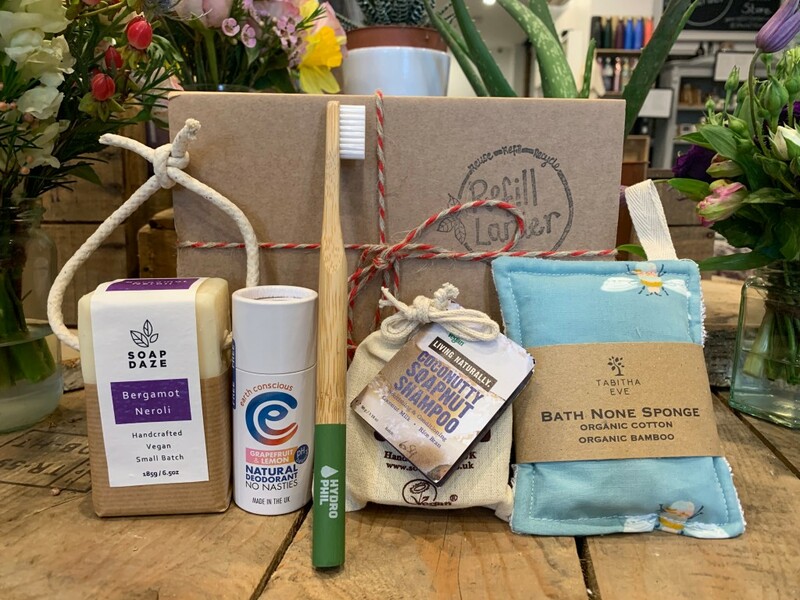 A perfect gift for those fed up with the mountains of plastic passing through their bathroom, including a bamboo toothbrush, soap on a rope, solid shampoo bar, natural deodorant and a bath none-sponge. The gift box price includes a 10% saving across the total cost of the individual products. - Water-neutral, vegan and fair bamboo toothbrush. The Hydrophil toothbrush is made from particularly fast-growing bamboo and the bristles are made from castor oil. 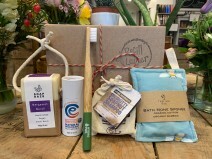 * Bath None Sponge: Made by Tabitha Eve the none-sponge is super absorbent and naturally antibacterial bamboo and cotton. Perfect for all the family, soft enough for babies! * Solid Shampoo Bar by Lamazuna. Zero waste, great in hard water areas, this scotch pine and silver fir infused bar is handmade in Paris. A very effective shampoo bar which is 100% vegan, cruelty free and sustainable. - Earth Concious Natural Deodorant, Grapefruit & Lemon scented. It is effective with a pleasant scent. If you would like different products in a gift set simply choose what you would like in your set and selct 'gift box' at checkout.